Kombucha is a raw, fermented tea. It is a great source of probiotics and has many health benefits. It is rich in enzymes and contains antioxidants, amino acids, B vitamins, trace minerals and other nutrients. It is also reported to help detoxify the liver. For this reason, you may want to start by drinking small amounts of kombucha. Kombucha can be pretty expensive to buy, but there is a very inexpensive alternative to paying store prices. 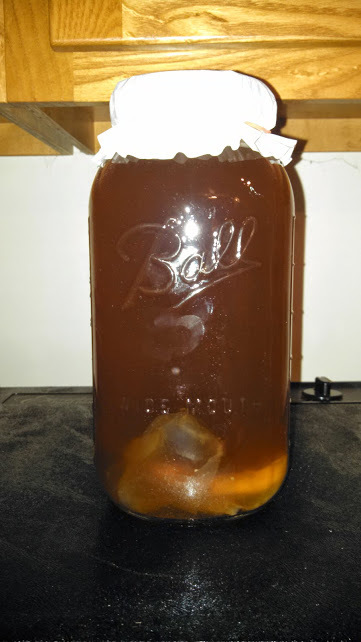 Today I will share how to make kombucha tea at home. Not only is it economical, it is very easy to make. 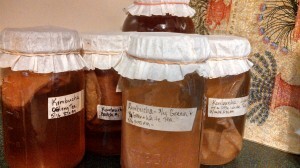 The first thing you will need is a kombucha SCOBY (Symbiotic Culture of Bacteria and Yeast). It is a living organism and looks like a gelatinous pancake. You can get one from a friend who makes kombucha. A new SCOBY “baby” grows in each batch of kombucha, so anyone who makes it will have extra ones. If you do not know someone who has an extra SCOBY, you may purchase one online. One source is Amazon.com. There is no need to buy the most expensive one offered. The SCOBYs are also sometimes sold on eBay. 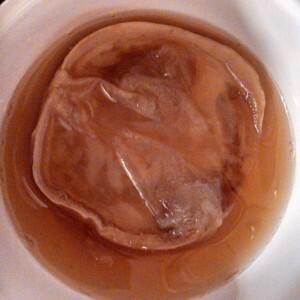 The SCOBY will come with some of the kombucha tea. Be sure to save this to use in making your first batch of kombucha. You will also need water, tea (black or green with no oils*), sugar, some of the previous batch of kombucha tea, and a glass jar (quart, half gallon, or gallon). This recipe makes one half gallon. Bring 2 to 3 cups of the water to a boil. Add the sugar, and stir to dissolve. Steep the tea bags for 10 to 15 minutes. Add the rest of the cool water to the sweetened tea in a glass jar. Make sure to leave room for the SCOBY and reserved kombucha tea. Wait for it to cool to room temperature. If the water is too hot, it will kill the SCOBY. Gently add the SCOBY and reserved kombucha tea. Cover with a coffee filter or cloth tea towel or napkin, and secure with a rubber band. Set this on the counter, out of direct sunlight, in a place it will not be disturbed. Let it ferment for up to two weeks. You may taste it after a week by gently inserting a straw beside the SCOBY, covering the end of the straw with your finger, and withdrawing the straw with some of the kombucha inside. Stop the fermentation when you like the taste. The longer it ferments, the more sugar the SCOBY will eat and the more tart it will get. You may drink it after it has brewed for much longer, but you may not care for the taste. At the end of the fermentation time, pour the kombucha tea through a strainer into another container. Reserve the SCOBY or SCOBYs plus enough kombucha to make the next batch. Repeat the process above every time you want to make more kombucha. You may now put the kombucha into canning or other jars with a tight fitting lid or into flip-top bottles. Be sure to use heavy-duty ones like those made for beer-making. You may add flavorings to the finished kombucha (but not to the portion you will use to make the next batch). You may add vanilla, ginger, or dried fruit. Experiment with other things. You will probably want to refrigerate your finished kombucha, to slow down the fermentation process. I usually like it plain over ice, but experiment to see what you like. Enjoy this homemade and less expensive version of a probiotic-rich and nutritious beverage. *Do not use honey, coconut sugar, or date sugar. If you decide to try an alternate sugar, be sure that you have a back up SCOBY, in case something goes wrong with the batch. I have not tried making kombucha with any of these, but I have read that they can sometimes turn out tasting off and may damage your SCOBY. Other people have had good luck using honey. **Do not use tea with oils, such as Earl Grey, which is flavored with bergamot oil, as the oil may damage your SCOBY. Do not use decaffeinated tea, as the SCOBY also needs the caffeine. Please comment below to share how your kombucha comes out and what flavoring you like or to ask questions. P.S. This post may contain affiliate links to products or services I use or recommend. When you make purchases through these links, you are supporting the companies or products I believe in, and you’re supporting DIY Probiotic Foods. There is no added cost for purchases you make through these links, but I earn a small commission, which helps to keep this website operating. Thank you! I am glad you found the information helpful.Thank you for taking the time to comment. You are most welcome, and thank you for the kind words and wishes. Your post is so good to read. Great!! Thank you very much for sharing, I will post it on my Twitter to share with my friends? Hello, Terry. You are welcome. I am glad to hear that you liked my post. Thank you for taking the time to comment and for sharing this with your friends. Thank you for your compliment. I am glad you found helpful information on my site. All the best to you.